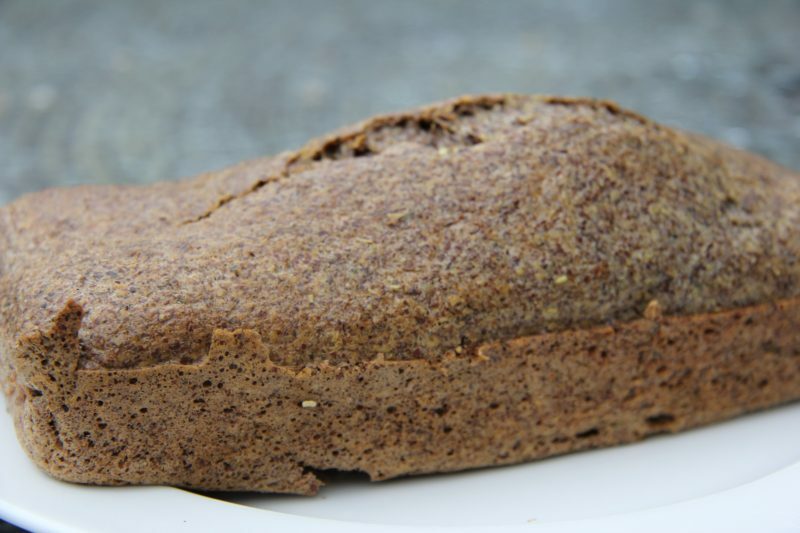 A healthy low carb bread baked from ground flaxseed that is also high in fibre. It’s an easy healthy recipe to enjoy sliced and toasted. 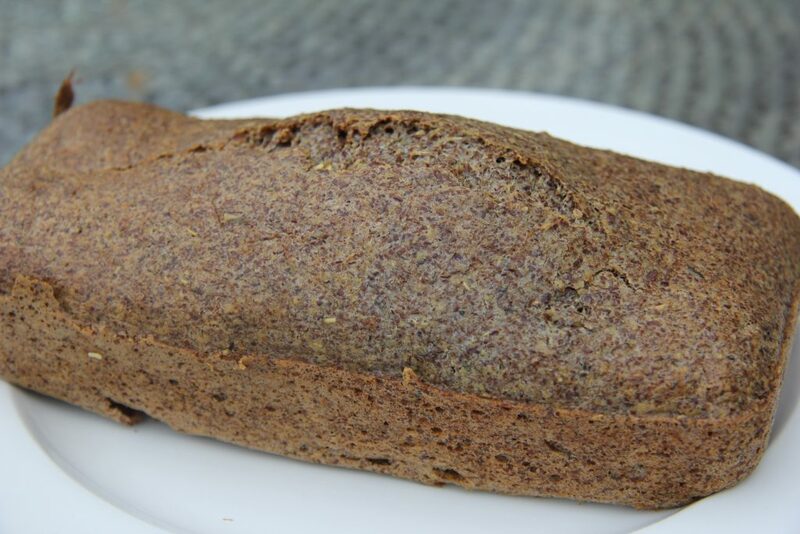 This is just an amazing bread…easy to make, low in carbs and gluten free! As well as full of nutrients, it is tasty and great toasted. Compared with the “traditional yeasty” bread, this is just a matter of mixing in a bowl, no dough kneading required! Just so easy to make! No waiting for it to rise malarky either! Another great way to get flax into your daily diet too! You could add herbs and other flavourings to this bread too! Change it to your own tastes. 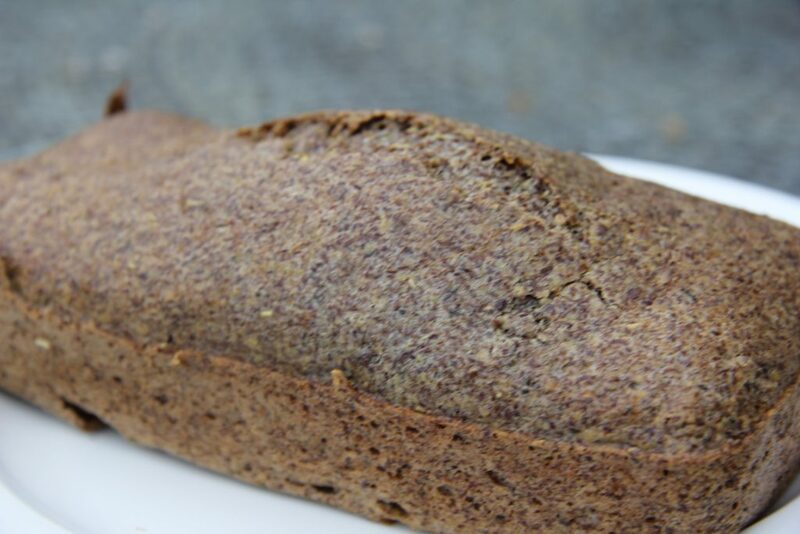 Alone, it tastes like a wholemeal bread (well to me anyway!). Some olives and sun dried tomatoes would be yummy….but your choice…your bread! Grease a 1lb bread tin with butter and line the bottom with parchment paper. Add the butter and water and mix well. Add the flax and salt and mix well. Put the mixture into the loaf tin and bake for 40-50 mins until firm. Hi, just wondering if you could please list the macros, Protein, Carbs, Net Carbs and Fat and how many servings this would make. looks great btw. Hi Jess, I’ve updated the recipe with the recipe card so it now shows all of the macros, as well as being printer friendly! Thanks for the recipe! I’ve made this a few times now and love it. I can’t eat dairy so I substitute coconut oil or olive oil. For a touch of savoury, I add a splash of tamari. 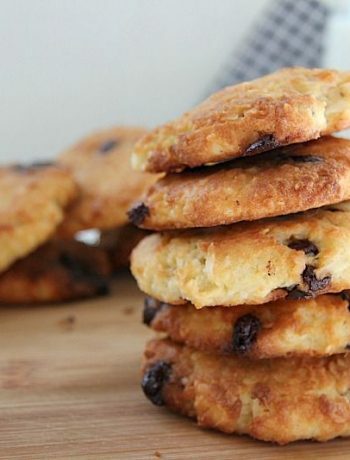 Looking forward to trying a sweeter version it with cinnamon and raisins! Thanks Maz. So glad you enjoy it! I like the idea of the coconut oil and will definitely try that! Hi Jessica, I would estimate about 3 net carbs per serving. Hope you enjoy it! I’ve been making this for a while now, it my go to bread for soup, but I couldn’t find the website I first found it. I just want to say thank you so much! Just came across this bread recipe—-it came out delish! I did add a few pinches of stevia powder and shook some cinnamon into it! it was a very faint taste of cinnamon so next time i’ll add more of both and maybe raisins! 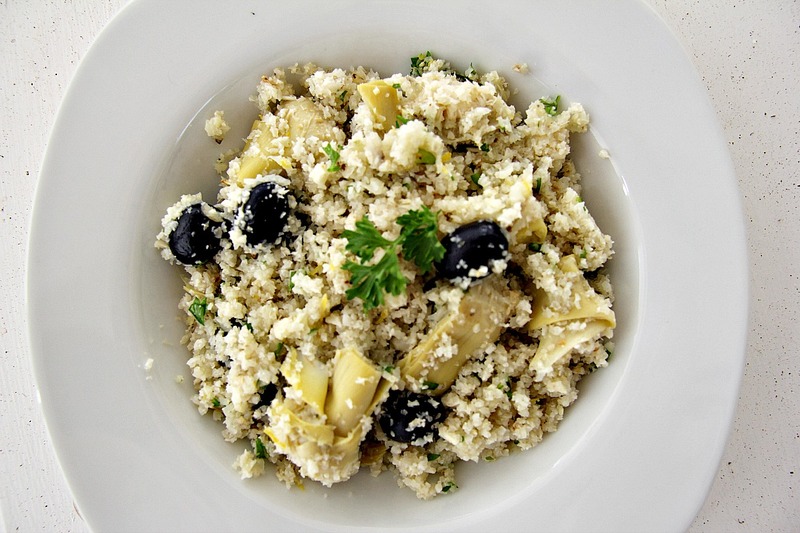 This recipe DOES seem very versatile! And so simple to whip up and bake, mine sliced beautifully, going to toast and eat with cream cheese/strawberries for breakfast! thank you! Glad you liked it Sheila and just LOVE your ideas of cinnamon! Will have to try that out as it sounds delicious!! 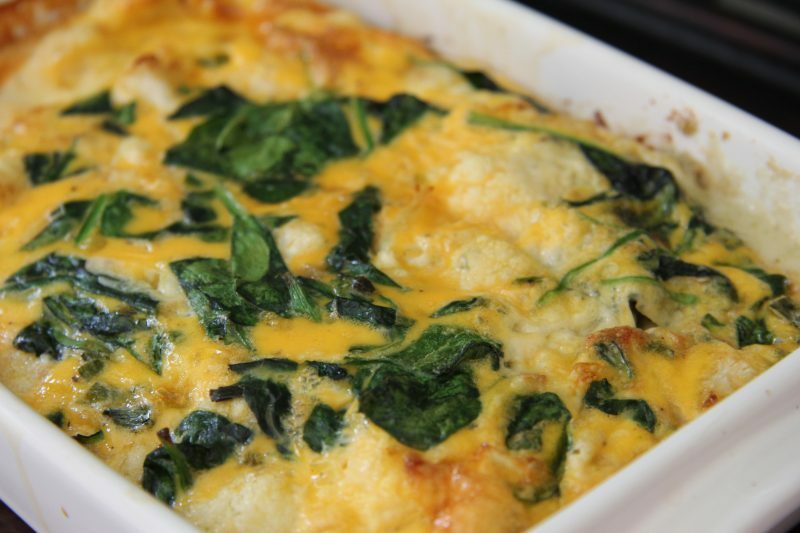 This is in the oven right now! Looking forward to trying it. BTW, loved you chicken/Thai red curry sauce skewers, too. Hi Becca! Thanks for stopping by! So glad you found my blog and dropped in! Am a lover of Flax too..! 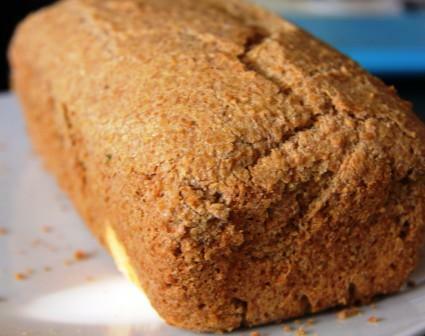 A great and easy recipe for a healthy bread! Great recipe..and seems fairly simple to put together…I would like experimenting with gluten free cooking…since I think I may be gluten intolerant….I have some gluten free rye flour at home…Do you think I could follow this recipe for a Rye loaf? Shyzie, it is so easy and great not to have to make bread with all that kneading too! Am intrigued about the use of Rye flour…my instincts are to say “Give it a go”…hope it works out. Please let me know how it went!